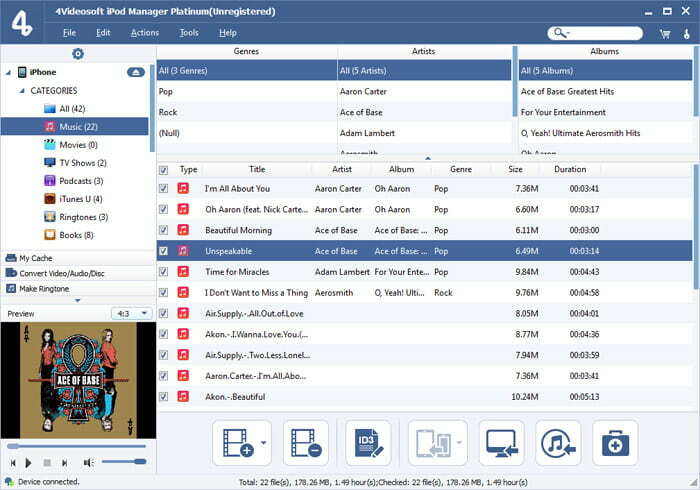 4Videosoft iPod Manager Platinum is able to transfer your music, movies, photos, e-books, etc. between iPod and PC. You can convert your DVD movies and videos to iPod MP4, MOV and M4V with the best quality. You are able to make ringtone for your iPhone. It can edit your output video with splendid video editing functions. Now it highly supports iOS 7 and the latest iOS devices. The iPod Manager Platinum is able to help you transfer iPod files like music, movies, photos, TV shows, podcasts, eBooks, etc. to your computer freely. And 4Videosoft iPod Manager Platinum enables you to backup SMS and Contacts to computer easily. You can transfer local files to iPod with no limitation. The program allows you to transfer files between different devices. 4Videosoft iPod Manager Platinum can convert popular DVD movies and videos to iPod MP4, M4V and MOV. You can enjoy these converted videos on your iPod touch, iPad Air, iPhone 5, iPhone 5S/5C and more. You can save the converted video to My Cache for feature use. You are able to make ringtones for your iPhone with local music. It enables you to extract the audio from the popular videos and DVD movies to make iPhone Ringtones. 4Videosoft iPod Manager Platinum provides you with splendid editing functions to edit your videos. You can modify video effect and reset the video length and video frame. It enables you to add text and image watermark as your preference. Also, you are able to merge two or more videos into one.